Geothermal Heat Pump Market size in 2017 was valued over USD 3 billion and the annual installation is projected to exceed 720 thousand units by 2024. Surging demand for sustainable, cost effective, and energy efficient space conditioning systems across commercial and residential embodiments will stimulate the geothermal heat pump market share. Increasing investment across real estate industry along with growing measures to promote environmental awareness are some of the vital factors influencing energy efficient technologies demand. For instance, ground source heat pump can reduce the energy consumption from 20% to 50% in the cooling mode and 30% to 70% in heating mode when compared with conventional HVAC systems. 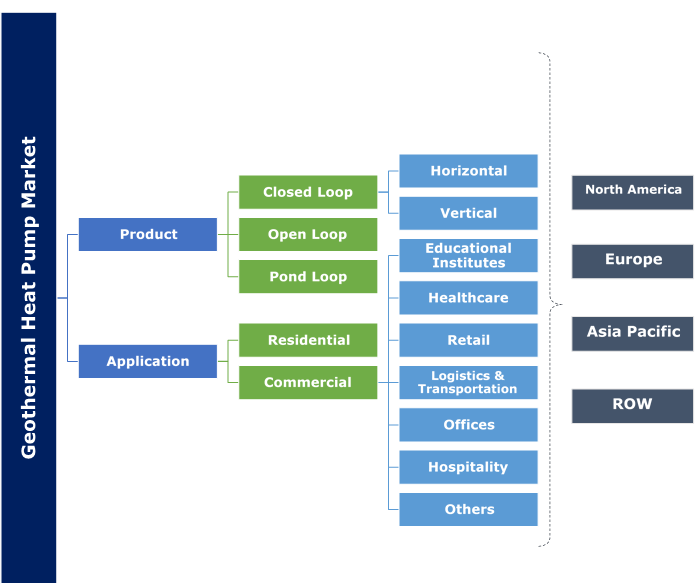 Low O&M cost, high reliability and less energy consumption are some of the imperative parameters which will fuel closed loop geothermal heat pump market size. The system circulates antifreeze solution for transferring the ground temperature to GHP through buried pipe which will enhance the product deployment. 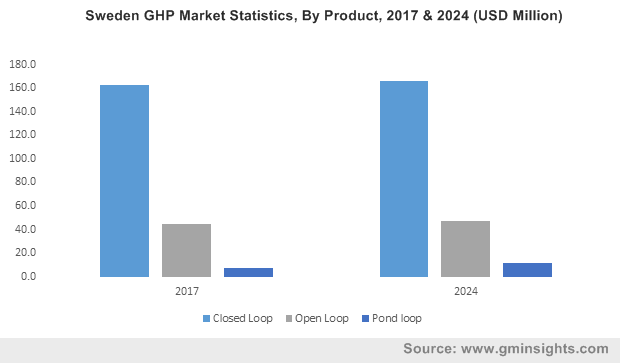 Open loop in 2017, accounted for over 15% of the geothermal heat pump market share. Ability to offer higher efficiency, low installation cost, minimize delay time and reduce heat transfer loss are some of the indispensable parameters fueling the product penetration. These products use ground water for cooling and heating applications and finds wide applicability across tenant finish installation. 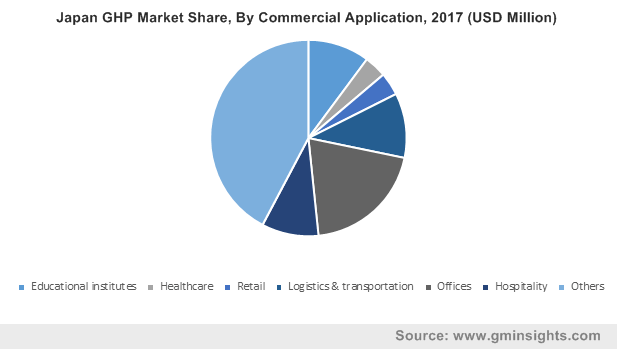 Residential application market will witness a growth on account of surging demand for revamping and replacement of conventional systems. The product ability to easily integrate with HVAC systems across existing and new constructed establishments will make its adoption preferable over other counterparts. Furthermore, increase in investment toward the re-establishment and refurbishment of buildings along with strong economic growth will further stimulate the industry dynamics. Commercial ground source heat pump market is anticipated to witness growth of over 3% by 2024. Introduction of several codes and standard toward green building infrastructure to reduce the GHG emissions by promoting the deployment of renewable technologies will positively influence the industry outlook. For instance, in 2017, the U.S. Governor Andrew announced to invest over USD 10 million under the rebate program, to reduce GHG emissions, promoting adoption of sustainable heating and cooling system in New York. Germany geothermal heat pump market is anticipated to expand over 20 thousand units by 2024. Surging demand for energy efficient heating and cooling system coupled with positive outlook toward net zero emissions building infrastructure will fuel the business landscape. Growing focus to reduce import dependency along with improving living standards will further augment the industry growth. In 2016, government of Germany declared to spend over USD 200 billion on infrastructure. Increased in investment toward single and multi -housing building infrastructure backed by population migration toward urban area and strong economic growth will enhance the U.S. ground source heat pump market size. In addition, availability of shallow ground temperature primarily in Wilkes/Scranton -Barre areas along with growing focus to limit the consumption of fossil resources will further complement the industry dynamics. Eminent players across ground source heat pump industry are Swegon, Thermic Energy, Solarbayer, Wolf, Toshiba, Systemair, Weishaupt, Trane, Vaillant, Viessmann, Glen dimplex, Stiebel Eltron, Bosch Thermotechnology, Danfoss, Modine, Mitsubishi Electric, Daikin, NIBE, Carrier, Bard HVAC, Spectrum Manufacturing, Green Planet Supply Technologies, OCHSNER Warmepumpen, ClimateMaster, Earthlinked Technologies and Nortek Global HVAC. Several M&A and collaborations has been witnessed in the marketplace, with an aim to enhance customer portfolio and expand global footprint. In 2018, Dandelion launched a geothermal system that enable the consumers save on electricity bills and reduce carbon emissions. GSHP is energy efficient system that extract heat from ground surface by circulating antifreeze solution through underground piping loops. The product harnesses a constant ground temperature as exchange medium. They are categorized by ground heat exchanger component, air delivery system and heat pump units. It is suitable for heating and cooling application across residential and commercial establishments.